Dry ice also known as cardice is one of best alternatives to regular ice and ice packs. Are they better options? Well, it depends. While dry ice has a better ice lifetime and extreme freezing capabilities which makes it favorite for keeping drinks and food frozen for the longest time possible, it does have some downsides – we’ll discuss that in detail as we proceed. 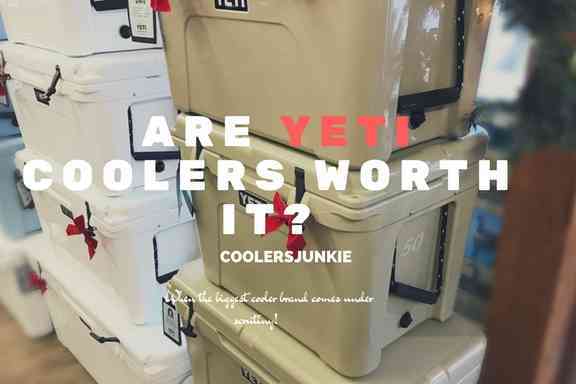 Most people use dry ice the wrong way, here at Coolerjunkies we intend to correct that and help readers so that you’ll have better results when using dry ice in a cooler next time. 1 What is Dry Ice? Far from regular ice formation through freezing of water, dry ice is made in the lab using carbon dioxide. Dry ice is colorless and does not melt like regular ice. It doesn’t melt but sublimates. You’ll like it, especially If you hate the soggy sandwiches as a result of the pool regular ice forms after thawing. You know that feeling in the summer when the sun scorches the most, and it’s as though you’ll die if you don’t get a cold drink to dehydrate your body. 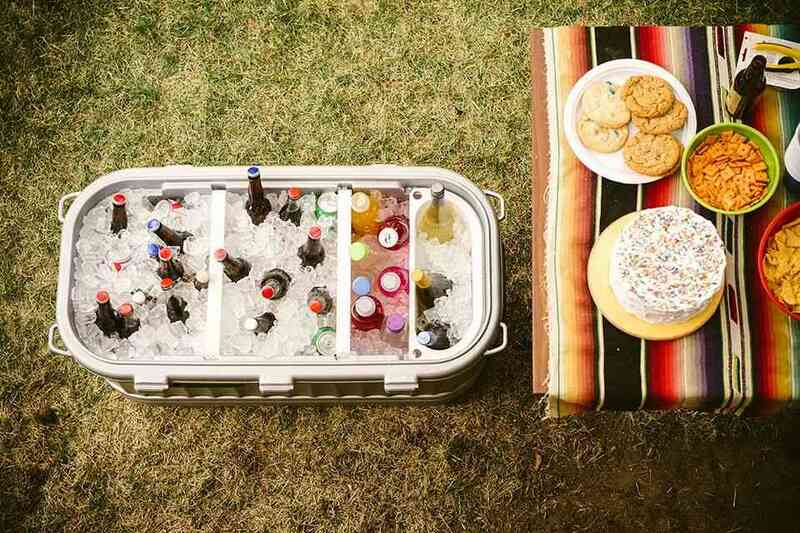 You reach out to the cooler, and all the ice is gone, all that is left is drinks and food floating on top. f**k, that’s the worst feeling ever. But it’s not the same with dry ice. 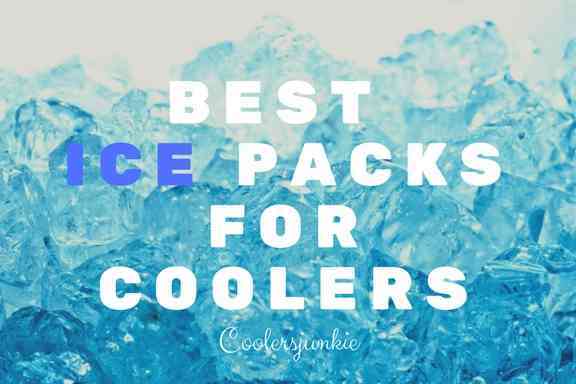 It freezes items, as long as your cooler is shut tight, even if it’s raining fire – you’d still have ice. This is good for hunters and fishers who would likely cut their catch and store for days. Dry ice has an astounding temperature of – 78.5, -109.3 Fahrenheit. There’s no rocket science, the aftermath of melted ice in an ice chest are wet items. Dry ice sublimates and instead of turning from ice to water, it skips the vapor part and transcends to vapor. Cool right? Even the greatest inventions have their drawbacks, and dry ice is by no means an exception. Handling dry ice requires extreme care – without protection you might get burned (frostbite). Another disadvantage is the dense cloud of smoke could cause hypercapnia. Dry ice is toxic to health. 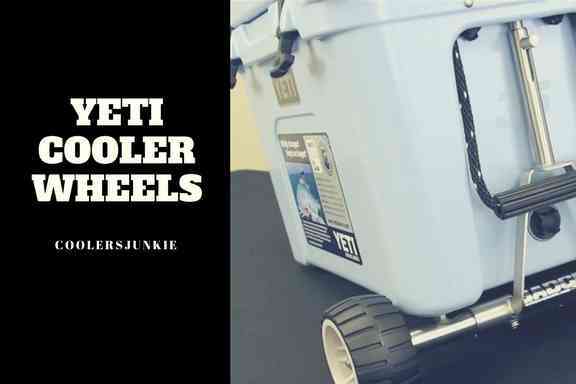 Not all cooler types are compatible with it as it could make plastic brittle. 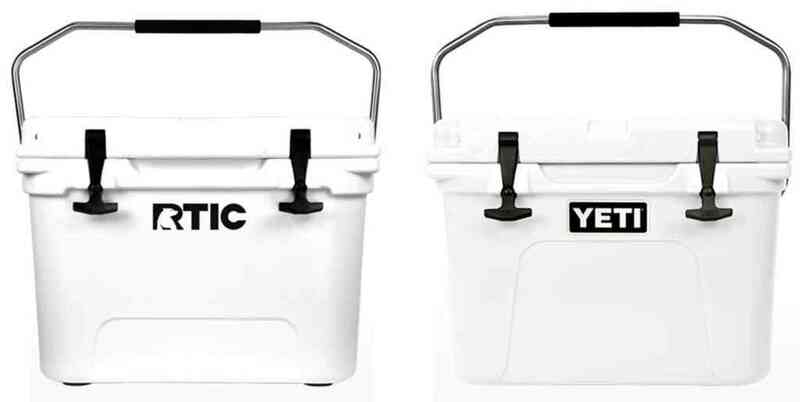 Many cooler specialists have approved rotomolded coolers as dry ice coolers. Using gloves or protective gloves especially if the blocks of dry ice are mixed with the drinks can save you from getting burned or frostbite. To minimize the risks of using dry ice, it’s advised to put the drinks on top of the ice. The excessive gassing of dry ice could lead to hypothermia – you could avoid such situations by unscrewing the drainage cap just enough for ventilation to get in. This reduces the amount of gassing when the cooler is opened. 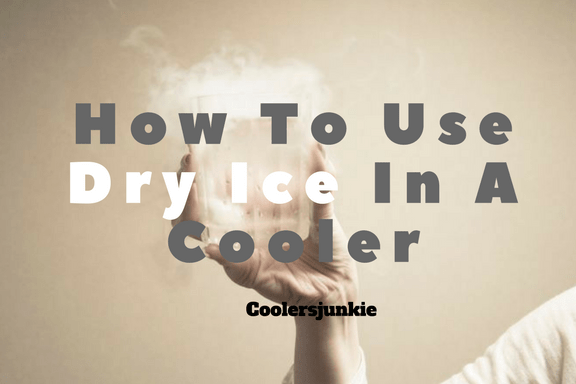 Depending on how you open your cooler, dry ice will escape through the lid fast. Wrapping it in a newspaper doesn’t just reduce evaporation but mitigate the risk of getting burned. 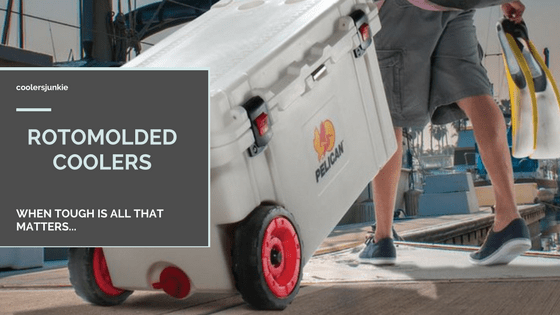 When it comes to keeping items cold, no equipment does it efficiently than Rotomolded coolers. Since the carbon-dioxide might make the walls of your chest brittle, however, its perils are no match for a rotomolded cooler. 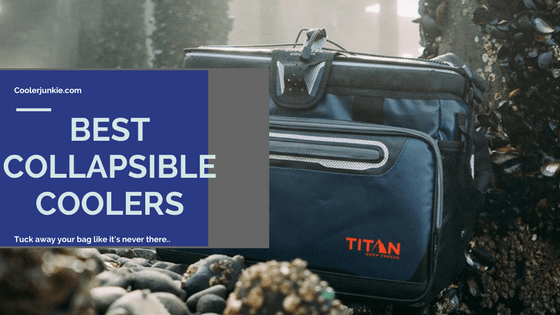 Dry ice can make plastic brittle; Rotomolded coolers are ideal for the job, so we’ve come up with the most robust options in the market. 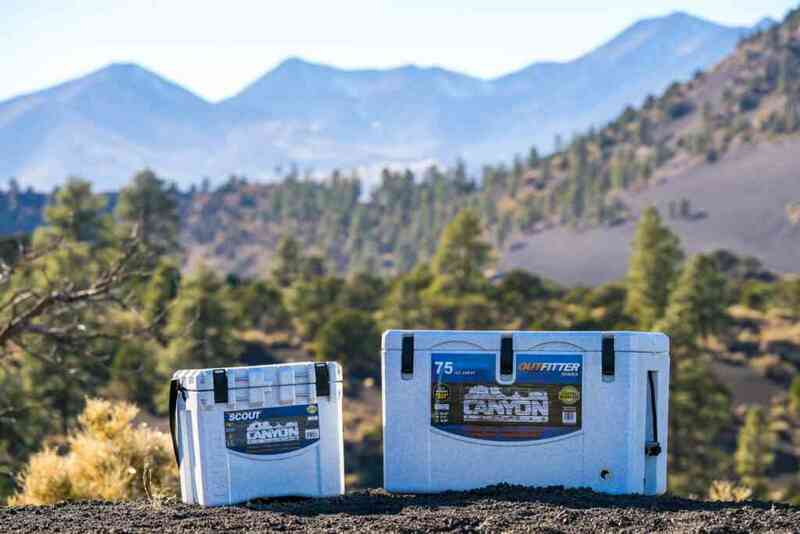 How you use dry ice in a cooler has a tremendous effect on its lasting period. For the best results, there are two basic ways of putting dry ice in a cooler. 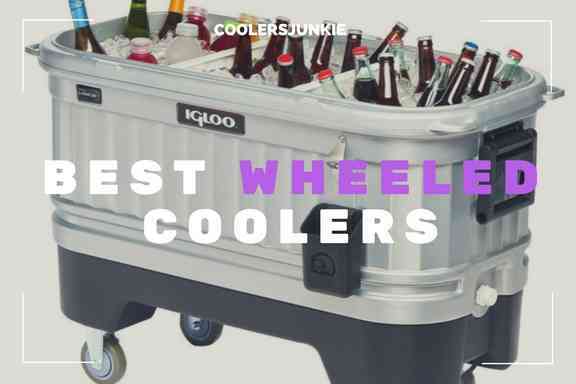 The first process is putting the ice at the base of the cooler and uses a barrier that allows just enough space for air to escape, then place all your supplies on top. This is ideal especially if you’d frequently open the cooler. Not only does the barrier reduce the rate of sublimation but reduces chances of burns and frostbite. Use cardboard or Styrofoam at positions where the ice is likely to touch. Even if you are using a rotomolded cooler, it’s best you avoid risking the interior to the perils of dry ice. As I’ve mentioned earlier, the ice at the base should be covered with cardboard with holes in it. Use protective gear despite stacking up items of the top of the ice. Whether you are hunter or fisherman, the most cumbersome to do is preserving your catch for a long time. While regular ice can keep your catch cold for a period, your catch is susceptible to get drowned in the pool of melted ice. You guessed right. Dry ice. Since dry ice is toxic, your catch should be bagged in polythene and place dry ice on top of it. The dry ice will sublimate, thus, it will circulate freezing everything in the cooler. Additionally, freezing you catch helps reduce the growth of bacteria. On a final note, there’s a learning curve when it comes using dry ice for coolers. Regardless, we included all there is it to know about dry ice coolers, safety, maintenance, and tips to prolong ice life. 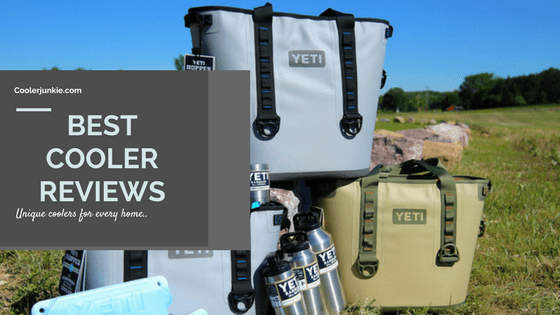 Previous ArticleYeti Tumbler Review – Is It Worth It? 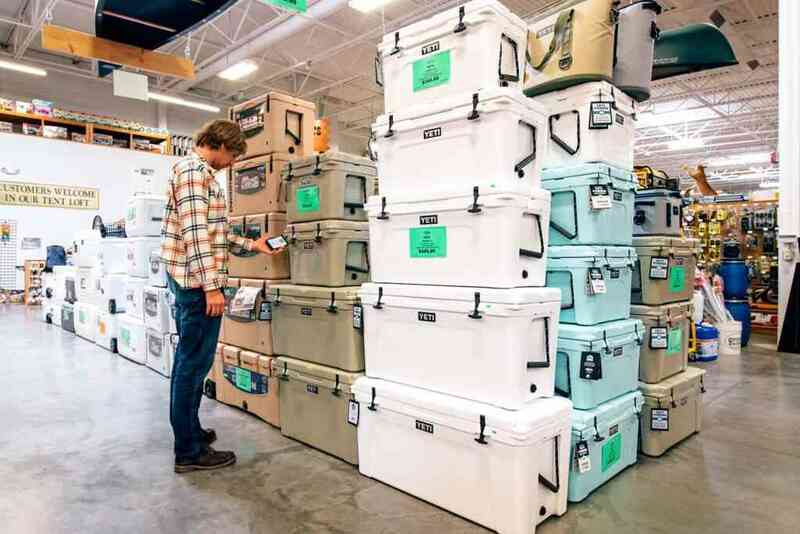 Next ArticleYeti Coolers On Sale – Everything You need to Know about Yeti Ice Chests!